Why did you choose Londonderry Mall? Did you approach them or did they approach you? The marketing director of Londonderry Mall approached me after reading my interview with Mack Male. She said the mall would love to host an art show, and since I was looking for a unique venue, it would work really well. She felt it would tie into Londonderry’s rebranding, too. I agreed the mall would be a really intriguing venue, so I took the opportunity. Was there any sign beforehand that they would react the way they did? There were no signs whatsoever — we had a two day installation agreed on a month prior (Sept 29, 30), and after the first day we were congratulated by the marketing team on how great everything looked. We finished the installation last night, and this morning I had an email from the marketing director saying that their crew had taken down everything without any consent from me nor the artists. There was no warning. Was any of the art damaged? I don’t at present know the state of the artworks as this has all happened within the past few hours. I hope it’s not damaged, but many of the pieces are very delicate (materials like fabric and tissue paper). The mall’s crew is simply not trained to handle these materials. More importantly, they had absolutely no consent to handle or remove the works. How much of your time did you put into this project? I conceived of the project last winter, and have been trying to make it happen for months. I have spent easily a couple hundred hours on this when all is said and done — scoping out potential spaces, calling leasing firms, making contacts, raising money, coming up with a curatorial vision, recruiting artists, mapping out the space, helping install into the early hours of the morning, and so on. Each artist put in at least 50-100 hours of their time analyzing the space, planning for it, driving there several times, buying supplies, and of course creating the works and installing them. I feel blindsided and disrespected and frustrated. And heartbroken. I will start the search anew for a home for Capricious! 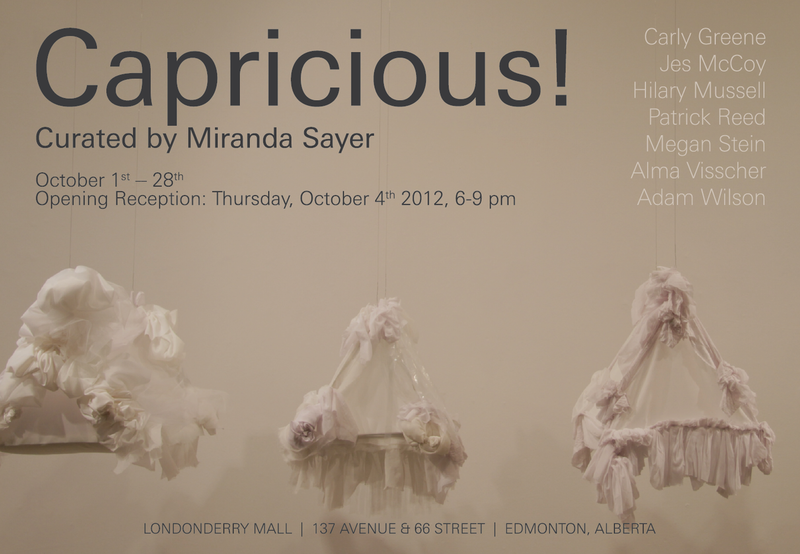 Mack D. Male (MasterMaq) – Edmonton Needs More Venues for Art Exhibitions Like CAPRICIOUS! The way Miranda is handling all this is amazing I think. This whole process sounds tiresome and frustrating with every obstacle she has had to overcome all for her passion of bringing free art to Edmonton to enjoy. What an amazing person. I am so glad that she is continuing to try and find somewhere to host Capricious! Having worked with the administration department of a mall, it could very well be that the marketing director did not get permission from the owners of the mall (High Peak Realty) in the corporate Toronto office before agreeing to the show. Either that or one or more of the tenants in the mall may have had an objection. It is a crying shame and very disappointing, but Miranda should not take it personally. The way Londonderry dealt with this is objectionable – hopefully none of the pieces are damaged. It was a fabulous idea though.